Lake Blanche is nestled high in Utah’s Big Cottonwood Canyon, with spectacular views that stretch as far as the eyes can see! Sitting peacefully under the dramatic Sundial Peak, this sparkling lake welcomes any hiker that is willing to put in the effort to complete this strenuous trek. Follow the trail into the high reaches of the mountains, where beautiful and rugged canyon walls are covered in lush forests and colorful wildflowers. When you stop to catch your breath, be sure to take in the surrounding views and breathe in the fresh mountain air. Be advised: your camera won’t even come close to capturing the beauty of the peaks and lakes at the end of the trail, but snap a few pictures anyway! While you are in the area, you may also be interested in this hike to Hidden Falls! It is short, gorgeous, and provides a more family-friendly option. One of the reasons why this trail is so incredible is because of the views it provides, but to get to the views you must first travel along a strenuous trail. This hike gains 2700 feet in elevation and is a steady climb the whole way. The most strenuous section is located near the end with many short switchbacks. The switchbacks take you to the top of this ridge with awesome views of the canyon below and the Great Salt Lake in the distance. After the long climb to the lake, we knew we were getting close when we saw the instantly recognizable crags of Sundial Peak within reach! The reward came as we made it up and over the daunting ridge we had just recently been standing a the base of. The views then open up to the stunning Lake Blanche in all her glory. We walked around Lake Blanche and sat on some rocks to soak in the views. We did not have the lake all to ourselves, but it isn’t hard to find a nice sitting spot with a little solitude. This hike is 7 miles round trip, with the option of extending to two more lakes, Lake Florence and Lake Lillian (which I HIGHLY recommend if you have the energy)! To find the other two lakes, take a right at Lake Blanche and walk counter-clockwise. The three lakes are connected by their outlets, so follow the water leaving the lake and you will see a primitive trail (don’t cross the rock wall) leading you down to the second lake, Lake Florence. Travel counter-clockwise around Lake Florence until you find its outlet, and then you will see the third lake, Lake Lillian. This is where we stopped for lunch and we had this lake all to ourselves! If you hike to all three lakes, your hike will end up being about 8.4 miles round trip. 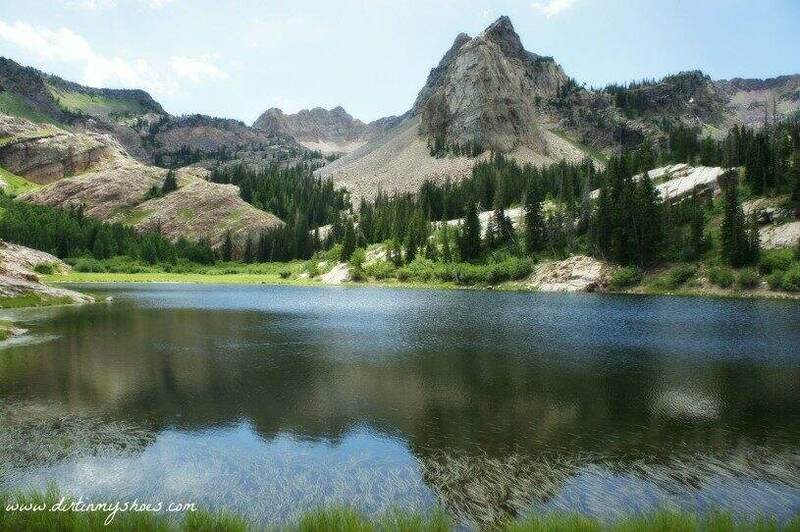 The Lake Blanche Trail is an incredibly popular trail, but don’t let the crowds scare you away. If you can find a way to complete the trail on a weekday, make it happen. The weekends are busy and finding a parking spot is nearly impossible. Start early in the morning for more solitude and more shade along the trail. This hike is located within the Salt Lake City Watershed, which means no dogs allowed and swimming is not permitted. Be sure to bring plenty of water (more than you normally would) because the climb along the trail is long and difficult. Depending on the time of year (July and August), bug spray is also a good idea! The trailhead has two parking areas. You will want to park in the Lower Lot (South) if you can. Otherwise, you can park in the Upper Lot (North) or along the road and walk to the Lower Lot where the trail begins. The first time I parked at this trailhead, I learned how confusing it can be. Several trails start from the area, and not everything is well-marked. To access the Lake Blanche Trail, you must first walk along the paved pathway that starts behind the restrooms. You will come to a sign with a map for the Lake Blanche Trail, but continue past the sign until you see a clear and well-used dirt path off to your right. We did not see an actual sign that said Lake Blanche where the trail actually starts, but the trail follows a stream at the beginning and has a few benches along the way. Have you completed this trail? Do you have questions about the hike? Let me know in the comments below! DO NOT SWIM IN THE LAKES!!! Plenty on water is for sure needed and bug spray . I love the Utah mountains I went through two bone marrow transplants for cancer and the Utah mountains were my catharsis and helped me heal and gain strength . This is one of my favorite hikes the views are breathtaking and well worth the journey . I hear of people camping at Lake Blanche, have you? You can camp, but no fires are allowed! I absolutely love your site! My husband and I are traveling to SLC for the first time next weekend for 3 nights. We want a nice vigorous hike with a trail that us east-coasters can actually follow (we live in Vermont and most trails are like long green tunnels). That being said- we chose the Lake Blanch trail and the Sunset Peak summit trail. I have two questions- being as it is a weekend- do you think the trails will be crazy busy even in early May? And lastly, if you think parking may be nuts (which we would like to avoid), what are you thoughts about hiking in the Uinta Mtns instead? If you hike either of those hikes, you’ll probably need to plan on hiking in snow as you gain elevation! And the Sunset Peak summit trail would need to be accessed from Big Cottonwood Canyon using the trail to Lake Mary because the road to the Catherine Pass Trailhead won’t be open yet. Otherwise, I think you shouldn’t have a problem getting parking. I love the Uintas, but the Mirror Lake Highway also doesn’t open up usually until the end of May or early June. Hope that helps and that you have a great time in Salt Lake City! Thanks Alicia, I’ll definitely have to try this one in the winter! Great post of Lake Blanche! My husband and I hiked this trail and also went on to Lake Lillian and Lake Florence last September. It was absolutely worth the effort! We went on a weekday and it was not crowded at all. Go early! The views along the way, as well as at the top, were absolutely stunning. It is challenging, but so worth it! It took us 5-6 hours for the whole thing, which included many breath catching breaks and our picnic lunch at the top. Very rewarding!